This photo shows the versatility of the pierced metal (or “punched metal”) wall light Model # PL1W. They light a bathroom vanity in a log home. The design blends perfectly with the rustic style home built by Ken Lacoy Construction. Searching for a unique Punched Tin Vanity Light? Consider Hammerworks handcrafted Punched Tin Hanging Light Model PL1. First of all this charming Punched Tin Cone Shade is available in both a hanging and wall mounted version. Thus you can combine both styles within your space for a coordinated look. 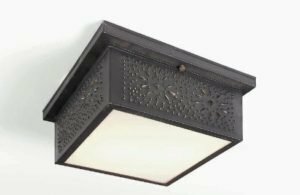 Or perhaps pair the wall mounted model with Punched Tin Ceiling Mount Lights CL117. 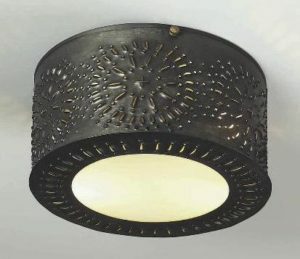 In addition Antique Tin Pierced Pendant Light Shade SH102 is an ideal companion. Furthermore as in the Colonial Punched Tin Witch’s Hat: CH101P the PL1 contains a “down light” in the center cone. We equip this center cone for a 60 watt medium base bulb. Finally like Colonial Pendant Tin Chandelier CH102P you can choose to have it pierced or not pierced. No matter which combination you prefer, you can be assured of receiving superior quality and craftsmanship. Each light within our collection of Colonial Pierced Tin Chandeliers is hand punched one at a time. The result is an heirloom quality chandelier made to last for generations. We offer a complete line of Colonial Wall Sconces to coordinate with Colonial Pierced Tin Chandeliers. Firstly the simple style of Rustic Style Wall Sconce S131A complements the PL1 nicely. Or if you need a double candle style consider Antique Wall Sconces S131. Perhaps you have space limitations. If so the compact dimensions of Small Tin Wall Sconce S108 or Vintage Tin Wall Sconce S102 are perfect. Furthermore you can choose from antique tin, brass or copper finish options within our collection of Vintage Colonial Wall Sconces. Therefore whether you are decorating a reproduction Early American Colonial, Cape Cod Cottage or New England Farmhouse, we offer the ideal combination of wall sconces & Colonial Tin Chandeliers. Consequently from kitchens and family rooms to bedrooms and hallways our punched chandeliers and sconces make a perfect decorating accessory for any home.